Buffalo State has been designated an “Eclipse Official Viewing Location” by NASA for the solar eclipse that will take place on Monday, August 21. In the “path of totality,” a 70-mile-wide arc stretching from Oregon to South Carolina, viewers will watch a total eclipse as the moon passes in front of the sun. 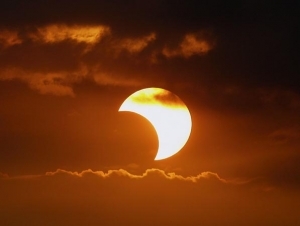 Here in Western New York, viewers will see the moon blot out about three-fourths of the sun. The eclipse is generating excitement across the country. Here in Western New York, Kevin Williams, associate professor of earth sciences and science education and director of the Whitworth Ferguson Planetarium, has been working for months to spread the word—as well as eclipse glasses—to the local community. Last April, Buffalo State hosted a training event for the Buffalo Eclipse Consortium in April to coordinate events and activities. The partial eclipse begins here at 1:11 p.m. and ends at 3:51 p.m. The maximum partial eclipse will take place at 2:34 p.m. During the eclipse, the planetarium will have telescopes equipped with solar filters on hand for visitors. Free eclipse-viewing glasses will be available, too. Faculty and staff can pick a pair up in Campbell Student Union in the bookstore or at the information desk. Just in case watching the moon creep across the sun for almost three hours strains your attention span, there will be plenty of other things to do. Lloyd's Tacos and Frank Gourmet Hot Dogs food trucks will be on site, and a variety of eclipse-related activities will be held. “We can adapt most of them for anyone who’s interested,” said Williams.